Stir with ice, strain into a rock glass rinsed with Vieux Pontarlier Absinthe (Pernod Absinthe), and garnish with lemon oil from a twist. After my shift on Saturday, I was in the mood for something spirituous so I turned to the Death & Co. Cocktail Book's section on Sazerac variations. There, I selected Joaquin Simo's 2011 Creole Sazerac; the recipe featured all things French with the Cognac and absinthe being produced in France, and the rum distilled and the bitters invented in the former French colony of Haiti. Once built, the drink gave forth a lemon and anise aroma standard to most Sazeracs. 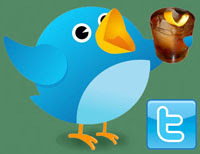 The rich sip led into rum followed by the brandy and the anise-driven spice on the swallow. 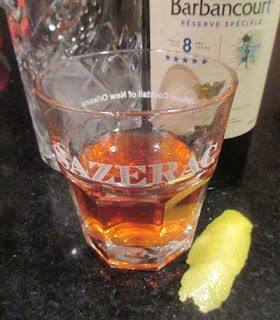 Indeed, the inclusion of Cognac and utilizing a softer rum provided a gentler version of the D-Day Sazerac.